The docking station is equipped with a stereo/microphone combination audio port and two USB 3.0 ports on the front panel, with one of these being an "always (power) on" port for mobile device charging. In addition, the rear panel has two USB 2.0 ports and two USB 3.0 ports, enabling maximum device connectivity. 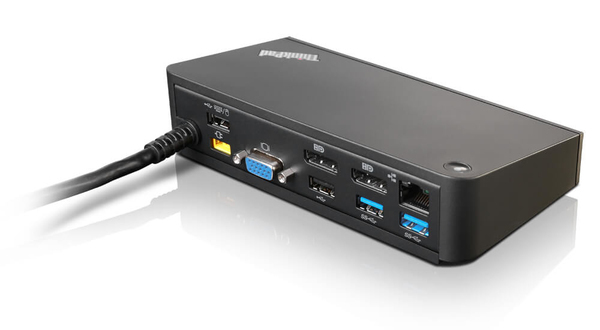 The OneLink+ Dock also comes with a 10/1000 Gigabit Ethernet port, one VGA port and two DisplayPort 1.2 ports for up to three video outputs* with a maximum resolution of 4K2K**. For security, the dock can be secured via a cable lock. With all these great features, the ThinkPad OneLink+ Dock actually takes up less desk space than other typical docking stations!